The historic Pensacola Lighthouse was built in 1859. 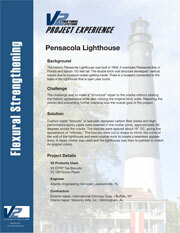 It overlooks Pensacola Bay in Florida and stands 150 feet tall. The double brick wall structure developed vertical cracks due to moisture (water) getting inside. There is a museum connected to the base of the lighthouse that is open year round. The challenge was to make a "structural" repair to the cracks without altering the historic appearance while also utilizing the original brick walls. Repairing the cracks and preventing further cracking was the overall goal of the project. Custom made "biscuits" or specially designed carbon fiber plates and high-performance epoxy paste were inserted in the mortar joints, approximately 90 degrees across the cracks. The biscuits were spaced about 18" OC, giving the appearance of "stitches." The biscuits were cut to shape to mimic the curve of the wall of the lighthouse and were counter sunk to create a seamless appearance. A repair mortar was used and the lighthouse was then re-painted to match its original colors.